Sometimes when people become distraught or dangerous criminals get cornered, they create situations where they can threaten harm to others in order to save themselves. Bank robberies, barricaded suspects, and hijackings can all give rise to crises that require special skills and tactics to bring to peaceful resolution. And that's where the job of a hostage negotiator comes in. What Do Hostage and Crisis Negotiators Do? 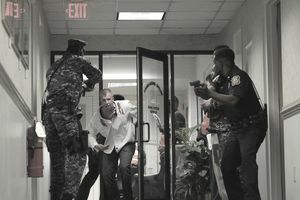 Often part of SWAT team call-outs, police hostage negotiators respond to crisis situations where hostages have been taken or where suicidal or dangerous individuals have barricaded themselves in and refuse to give themselves up. Their role is to speak with the subjects involved and convince them to turn themselves in peacefully, without hurting themselves or others. Though typically called hostage negotiators, the more appropriate term is crisis negotiation since negotiators work with people in all sorts of tumultuous situations. Crisis negotiators use communication skills and their knowledge of psychology to identify who is in charge or in control during hostage or crisis situation, engage in dialogue, gauge the state of mind of the subjects involved and relay crucial information to other on-scene officers. The information they can gather and provide can help influence the decisions and actions of the command personnel, and the dialogue they enter into can potentially save the lives of not only any hostages, but responding officers and even the suspects, as well. Most hostage negotiators get their start working as police officers, which means the first thing you'll need to do is make sure you meet the minimum qualifications of a police officer and work toward becoming a cop. Typically, hostage negotiator opportunities are in larger police departments, sheriffs' offices and state and federal law enforcement agencies. As specialty positions, it may be a few years before you can become eligible to move into a crisis negotiator position. Often, negotiators come from the ranks of police detectives or special agents. You may need to build years of experience in other areas, including tactical response teams and criminal investigations. The National Council of Negotiation Associations (NCNA) recommends that potential negotiators have a high level of self-control, be able to remain calm even under immense pressure, possess extraordinary interpersonal skills, be able to use active listening, and be able to work well within a team. Initially, negotiators typically receive at least 40 hours of training in topics such as psychology, crisis intervention, active listening and incident management. They also review case studies and role-playing scenarios. Once trained, negotiators undergo continuing education and advanced training, review case files around the country, and network with other crisis negotiation professionals to learn and compare ways to be even more effective at their jobs. Hostage and crisis negotiators generally earn the same salary as any other police officer, special agent or criminal investigator would with the same rank and years of service. This means that depending on the department, education and experience level, negotiators can earn between $30,000 and $90,000, sometimes more. According to data reported by the NCNA, crisis negotiators are successful in bringing about a safe, peaceful and nonviolent conclusion in 79 percent of call outs. As a hostage negotiator, you, too, could play an important role in keeping innocent civilians, police officers, and troubled suspects safe and free from harm.